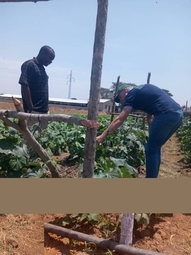 I am working as the Agronomist and product development manager at Holland Greentech in Zambia. Holland Greentech offers an integrated package of inputs for horticultural production in East and Southern Africa, that is hybrid vegetable seeds, drip irrigation, greenhouses, biological pest control, soil analyses and services such as training and advice, installation and maintenance for the different products. Promotion of our seeds and offering advise concerning crop production, soil and fertilizer advice. Trainings on issues related to vegetable production and soil analysis. Assist the Business developer assigned to Zambia in establishing our company as it set up offices in December of 2017. So basically, getting the necessary registrations and licenses for operation. Data collection from legume- cereal rotations as part of a research under conservation farming. Preparation of demonstration plots for Agricultural expo. I was involved in Collection, analysis and interpretation of field and laboratory data for selected soil chemical, physical and microbiological properties including land surveying and evaluation of selected land qualities. CEPHaS- Strengthening Capacity in Environmental Physics, Hydrology and Statistics for Conservation Agricultural Research where I worked as a research assistant.